I have yellows & a lot of yellow based golds and I either wear the bright ones alone & the golds with browns also. yellow looks lovely on you. I sometimes wear yellow eyeliner! I do a line of purple and then on top a line of yellow. I know it sounds odd but it looks really cool! I use it in the summertime..!!! (excuse my english...). Very beautiful combination, and I do wear yellow e/s, as my eyes are greenish blue and it really suit on my eyes. And I agree with you: NO RAINBOW BUSINESS!!! I wear matte yellow on occasion, usually something along the lines of Beyonce's makeup in the telephone video. 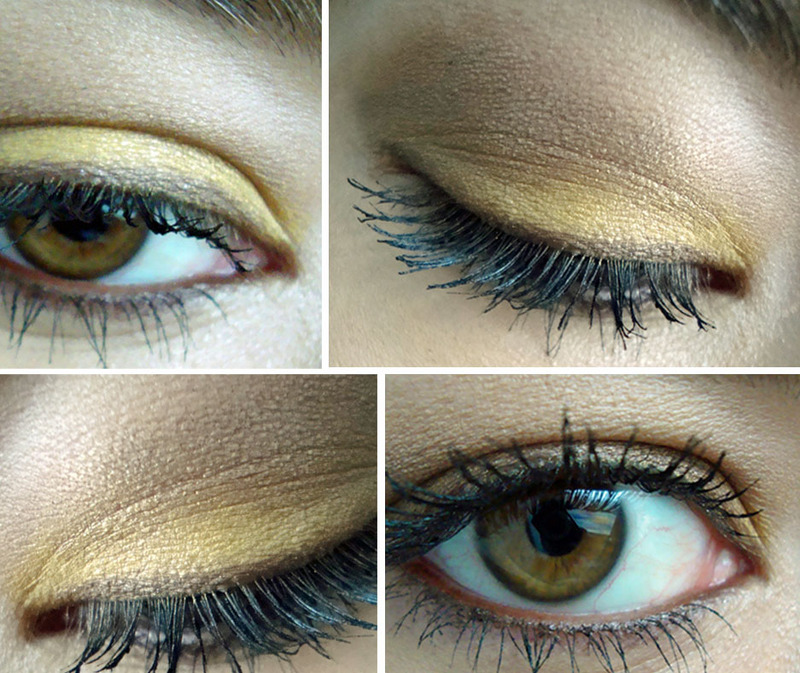 A little bit of brown in the crease tones it down nicely, but its still a very yellow look. But I wear neons, so maybe I'm not the best person to ask! Lovely look! How did you pop out the insert in your MAC eye shadow palette? I love yellow eye shadow! In fact I think it's the opposite of scary, as long as you dont go over board. Live a little! I wear a lot of yellows ^^ well, yellow-golds to be exact. i've never tried yellow eyeshadow in a wearable look before, thanks for the idea! Looks very pretty! :) You know I love bright colors and wear them even not toned down :) But this is a great way for those who don't like it as much as I do! You did a great thing by removing the partition thing on your palette, I did it a while back and couldn't be more pleased! How many more palettes can I have?! I wish they came magnetized though! Guess I could always get a Z palette..
You just killed me with 'no rainbow business'!!! I said it to a makeup artist when she was doing my eyes just the other day! I couldn't do it myself as my skin is so yellow toned in the first place, but it looks beautiful on you! i have bright future and am never sure how to wear it without it looking ott, so thanks :D i'm going to try this tomorrow. I love pairing bright future with nars night clubbing (gold black).... but now i have to try to use it with bronze eyeshadow! You look beautiful as always!!! I have Going Bananas (which is now back in the Dare to Wear collection) from the C-Shock collection that came out 3 years ago. Sometimes when I am in the mood for a great burst of color on the eyes I use it on the inner corner with a peachier color on the outer half and add some winged out black liner. I keep everything else simply and keep the "sunshine" in my eyes. Its great for those gray days too! that shade looks pretty with your eye color. i don't think I could pull it off but I love wearing gold tones. Great idea for the palette! Did you put a magnetic strip down or glue them in? I will wear yellow shadow now! You made this look sizzle. Love the pairing with bronze. Plus your skin tone is so perfect for a little splash of color--lucky lady!! I actually got Bright Future somewhat recently, but haven't worn it as yet because I wasn't sure what to pair it with. Well, that and the fact that I get too many new things too often and it sometimes takes me a while to get around to trying anything. I'm completely guilty of using the same things over and over and neglecting new beauties. But that's another story. I love how you paired it with Bronze, I will have to try that combo! I don't have a lot of yellow but i think mixed with a dark a brown or a bronze it's very wearable and beautiful on my dark skin! OMG I love it!!! Looks so good on you ;) I might try it but I don't know if I could pull it off!!!!!!!! Very wearable look, brown is always great to tone down those bright yellows, but my peronal favourite is a darker brown/grey shade, it makes it even smokier, which I love! Give it a go and let me know what u think! I absolutely LOVED this post!! I am a new follower, and I have been wanting to wear yellow shadow for so long!! I am not sure how it will look on my skin, I'm very white!! lol, but I am definitely going to try mixing with brown.